Hāto Maunten senchineru: Japanese edition of Heart Mountain sentinel . Heart Mountain, Wyo., September 4. (Heart Mountain, WY), Sep. 4 1943. https://0-www.loc.gov.oasys.lib.oxy.edu/item/sn93070119/1943-09-04/ed-1/. 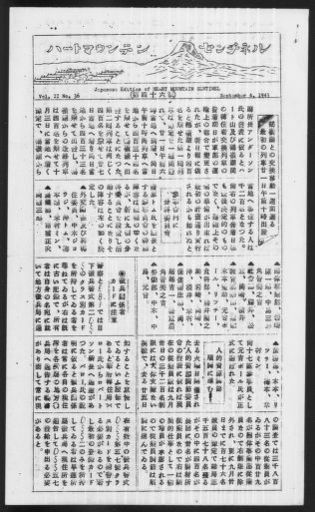 (1943, September 4) Hāto Maunten senchineru: Japanese edition of Heart Mountain sentinel . Heart Mountain, Wyo., September 4. Retrieved from the Library of Congress, https://0-www.loc.gov.oasys.lib.oxy.edu/item/sn93070119/1943-09-04/ed-1/. Hāto Maunten senchineru: Japanese edition of Heart Mountain sentinel . Heart Mountain, Wyo., September 4. (Heart Mountain, WY) 4 Sep. 1943. Retrieved from the Library of Congress, www.loc.gov/item/sn93070119/1943-09-04/ed-1/.